Today I start the mammoth journey home. A flight from Kangra to Delhi, and then much later tonight, Delhi to home. I feel so blessed to have been able to take this journey, but I am missing my fur kids. I will be happy to come home. I love India. What an amazing place. So many paradoxes. Technology has pushed communication forward but still so many rituals observed. Possibly the most amazing thing about India is the spirituality and reverence for deity. Even still, to some it is about consumerism. On Monday during our tour of Dharamshala, we were stopped on the roadside. I didn’t know what was happening but these people had been pulling everyone over. They ask for money, give a handful of rice, and I think a blessing of sorts. I gave 10 rupee. The man asked for more and my guide showed him an empty wallet. We drove off and laughed. I think I understood the situation. And, women. So many arranged marriages. And traditional and modest clothing, except for adolescent girls, who wear tight jeans. It’s interesting to watch. Personally, I love the clothing and am thinking of adopting the style at home. I love the colours. And then I read about the acid burning, the abuse, and I am grateful that I haven’t seen it. I have received questions about not being married and travelling alone. And if I am being honest, I don’t think I would travel here alone again. I have felt mostly safe this time but I have been guarded here. And a bit of a novelty. I shall miss the busy and the relaxed side by side, the monkeys, the cows, the dogs, the beauty of the environment, the intense reverence for ritual, and the feeling you get when you connect with the local people. 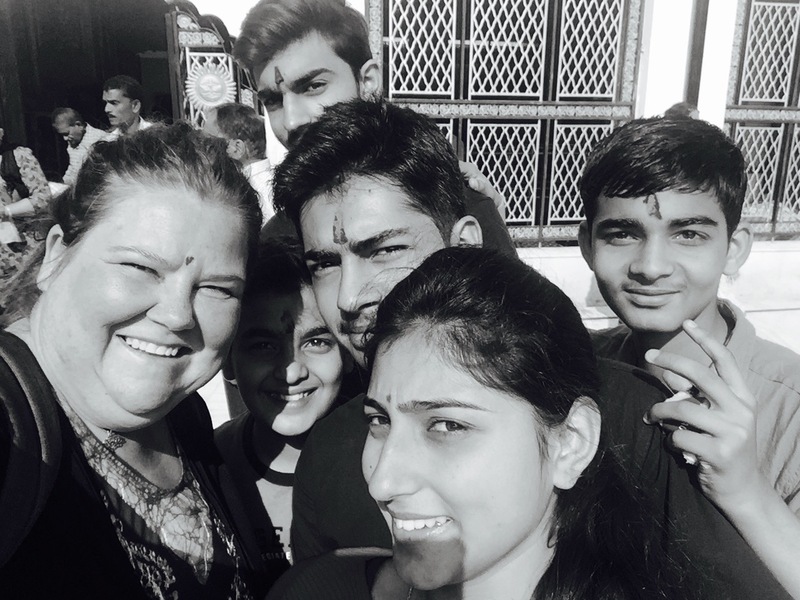 In the goddess temple on Monday, I was the only western woman, had no real idea what I was doing, and was adopted by a young girl, who taught and explained the rituals. Her brothers were impressed by her boldness, and this inspired other women to talk to me (about my hair – freaked them out). That connection was raw and powerful. It was lovely. And then, at the church, I felt none of that life or passion or raw ritual. Western religion is definitely not for me. I’m wondering how I will embed ritual into my life when I get home. A spiritual ritual. Setting up an altar will be first. I’ve fallen for Green Tara in Buddhism; the connection was strong. I might start there. At any rate, an amazing trip that will impact my choices well into the future. I would like to become involved in organising resources for the school Mel and I visited last Friday (the reason I am so sick I am sure). I want to write. I want to run groups for healing and growth. I want a less rigidly structured life with more freedom and empowerment; I no longer want to be a slave to the machine. I am blessed. I am free. Final regards from India. Tomorrow I will be home.